The first step in choosing a Krav Maga school is the same as it is in choosing any martial arts school; define your goals. What are you looking for? What do you hope to achieve? Is it practical street self defense? Preparation for your basic training in the military? Self confidence? Or just lose a few pounds and get in shape? Once you have defined your goals you are ready to start looking. Don't tell the school owner what you are looking for since most likely he will tell you that that in fact is their specialty. Rather, ask them what the focus is in their school, or what kinds of programs are available. Ask to observe a class. The instructor's qualifications are important. Make sure he or she is certified by a legitimate organization, inquire how long he or she has been teaching, and whom they trained under. Most legitimate instructors will have their diplomas on display. Once that is out of the way, look at the students. This is your most important indicator. It is not really that important if your teacher was the undefeated champion of the world, as so many instructors seem to be these days, or if he says he is a war hero who single handedly defeated an entire brigade, true heroes don't brag. Look at the students, not the teacher. What is important to you, the student, is what you can learn here what others have learned here. If you see a student who looks impressive – that's your first indication that this could be the right place to train. Walk around the school, talk to the instructors and students. Do you feel welcomed? Are they open to your questions? Do you feel comfortable here? You will be spending a lot of time here, make sure the environment is right for you. Ask about the financial plan; do they require you to sign a long term contract? Do you feel comfortable with their requirements? Make sure you are not committing too soon. Most schools will at least allow a trial period. Make sure they are interested in you, and not only in your wallet. It is your responsibility to make sure the place is safe. Are there wires sticking out of the walls? Are the restrooms hygienic? Do they have gladiator fights to the death? A lesser known, and harder to determine, point, is; does this teacher continue to train with someone? Is he or she still growing, learning new techniques, staying on top of changes in the field? 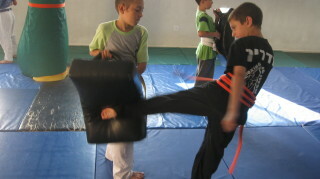 Or just teaching whatever they learned twenty years ago when they earned their black belt? If you have a friend who has done some martial arts training, and most people have at least one such friend, bring them along. A second opinion never hurts.